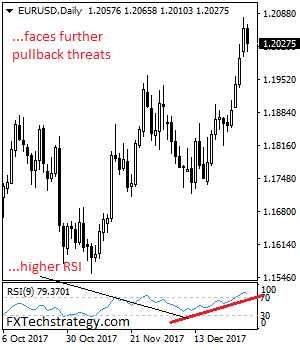 EURUSD - The pair failed to follow through higher on the back of Tuesday gains on Wednesday. This development leaves it weak and vulnerable to the downside. On the upside, resistance comes in at 1.2050 level with a cut through here opening the door for more upside towards the 1.2100 level. Further up, resistance lies at the 1.2150 level where a break will expose the 1.2200 level. Conversely, support lies at the 1.1950 level where a violation will aim at the 1.1900 level. A break of here will aim at the 1.1850 level. Below here will open the door for more weakness towards the 1.1800. All in all, EURUSD faces further downside weakness on price halt.